Today’s post on Rogue Warden is another interview with a veteran game designer: Bill Keyes. I’m excited about this interview because Bill is not only a fellow member of the gaming industry, he’s also a good friend and a fellow gamer par excellence. 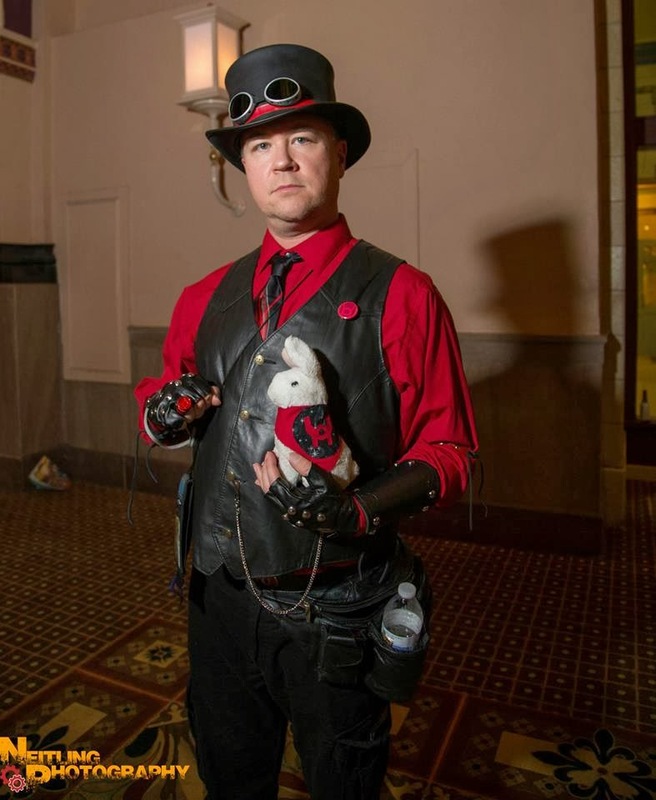 He and his wife Tammy have been running games at Genghis Con in Aurora, Colorado (organized by the Denver Gamers Association) for several years now, and they are not only great people—they are great gamers too! Bill has worked as the Art Director for Hero Games for a number of years, and he’s also done quite a bit of graphic design and layout for numerous projects for Blackwyrm Publishing. 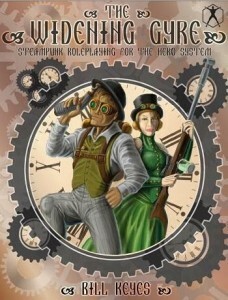 In 2011, Bill also published his own game setting, a steampunk world of high adventure called The Widening Gyre. Bill represents a gamer who lived his dream—he joined an RPG company as a professional and published his own creation. His story is one that hundreds of fellow gamers all want for themselves. I wanted to feature Bill’s interview not just because he’s a friend, but also because his story is interesting—Bill’s just at the start of his gaming career, and doing it outside of the major game studios in the RPG industry. BK: I’ve been a gamer for better than 30 years. I started with the original hardback AD&D books (which I still have, and will proudly show them off to anyone foolish enough to ask!) way back in 1980. We were just kids and we had no idea how to play, really. We just sort of rolled dice and made things up (so not much has changed between now and then!). I discovered the Champions Superhero RPG not too long after that, and I’ve been running various heroic adventures ever since. People keep coming back to play, so I guess I must be doing something right. As a game industry professional, I’m primarily an Art Director and Layout Artist. My background is in technical writing – basically writing software and medical equipment manuals, which is a very different skill-set than RPG book layout. But somehow I’ve made the RPG thing work. I’ve also written one (well, two, but that’s another story) RPG setting book that’s been published (The Widening Gyre, a steampunk worldbook for the HERO System from Blackwyrm Publishing), and in my spare time I’m working on a couple of others. Bill is the one who made me a believer in the power of Lucha. BK: I have two stories here. As a writer, I heard about a small HERO System licensee who was looking for someone to write a steampunk book for their superhero setting. I submitted a proposal which they liked, and I got to writing. The book was eventually released in PDF format, and sold probably 20 or 30 copies, tops. But those few people who bought it really liked it and said I should write more. So I am. As an Art Director, it starts with a sad story. The AD for HERO, Andy Matthews, passed away very suddenly, and the company had to scramble to find someone to finish the books they had in the pipeline. I’d never done layout for game books before, but I’d been a Technical Writer for the better part of a decade and I’d done more than my share of layout for other industries. So I put in my application. I’ve known the HERO guys for years and they trusted me, so they gave me a book called Lucha Libre HERO to put together. I had a lot of fun on it, and have been working on similar projects ever since. BK: Um… everything? Seriously, this is sort of a dream come true for an RPG nerd like me. I’ve always wanted to write books, and more than that, to have people play in the game worlds I’ve created. I’m such a fanboy. Oh, I know! It’s neat to stand next one of the people whose work you admire – a Jeff Combos, or a Steve Long, or an Aaron Alston, or a Ken Hite – and be able to say, “I’m one of you guys.” Of course, I’m like a 1st level adventurer standing next to a bunch of epic-level guys. But still, it’s cool to be part of that club. BK: Quite frankly, the money. I know a number of people who make a living doing this, and I’m sure there are probably a couple of folks out there who got rich in the industry, but for the most part (in my experience) there’s just not a lot of money out there. Or maybe I just have expensive tastes, I don’t know. But if you’re thinking of quitting your day job and doing this full-time… well, let me know how you do it. BK: I’ve only been working professionally in the industry for about 5 years, so I can’t honestly say what it was like pre-2008. I still feel like I’m on the upslope of the learning curve about the industry, so everything that I find out is something new to me. BK: One thing I do now that I never thought to do when I was first starting is to get as much groundwork done as you can before the project actually starts. When I’m doing layout, I work on designing my templates, choosing my fonts, and creating a watermark well before the finished manuscript even makes it to my desk. I ping my favorite artists to see if they’re available and interested. I will usually throw together a 5-page demo of what I think the book should look like so I can send that back to the writer and the publisher and get their approval. There’s nothing worse than having a finished manuscript and a hard deadline and not having any idea what the finished book is going to look like. I like to have all my ducks in a row, because I hate wasting time at the beginning of a project and then rushing to get everything finished at the end. Same thing when I’m writing. I put together an outline, which is basically a list of all the things I want to write about. That way, I have a pretty good idea of where I’m going before I even start. Sometimes things change halfway through, and I come up with a new direction to go in or decide that an idea I had is not really panning out, but it’s good to create a roadmap before you set off. BK: Don’t promise what you can’t deliver. That’s what professionalism boils down to. If you tell someone you’ll return their phone call right away, do it. If you promise to get your project done by the end of April, you had better have it ready by the end of April. If there are extenuating circumstances that are going to prevent you from finishing on time, let everyone else know as soon as you know. I’d much rather have someone I’m working with tell me up front, “I don’t think I can finish the project on this deadline,” rather than have them come to me after the deadline has passed with an apology. The first might disappoint me; the second can derail a whole project. BK: I don’t know if I can answer this question. I still feel pretty new to the industry, so I’m not even sure what’s “normal,” much less what should be changed. Is that a cop-out answer? BK: Even with the tools we have today (by which I mean the internet), I think there’s really no better way to meet people and show them what you’ve done and will be doing in the future than by meeting them face-to-face, and ideally, by gaming with them. That’s one of the many reasons I love to run adventures at cons. “This is the world I built/the game I’m creating/the system I’m working with” is a powerful thing to say. Gamers love to feel as though they’re part of the creation process, so play-test something with them! Bill’s exciting steampunk adventure setting! BK: Again, I have two answers for this. As an Art Director, my greatest and favorite book is Lucha Libre Hero. It’s just so full of weird peyote-fueled nonsense that I can’t help but love it. I remember emailing my artists and telling them, “OK, I need a picture of a giant hourglass with the wrestlers trapped in the bottom, and a giant scorpion, and a line of can-can dancers, and a rocket ship about to blast off*. Can you do that?” And the artists would respond, “What did you just say?? ?” And then a week later they would turn in some absolutely fantastic pieces of artwork. But by far my proudest moment was when my first book got published. When my copy arrived in the mail, I just stood there and stared at it for about 10 minutes. I feel like such a geek saying that; does that happen with everyone when their first book comes out? Does it change when you get more books published? Like, by the time the tenth book comes out, do you just shrug and toss it in the pile with the others? *This is actually in the book. I’m not kidding! BK: I don’t know if this counts as a setback, but it was definitely a Charlie-Foxtrot. I was the AD for the 6th Edition HERO System Bestiary. It was a huge book, with a new piece of art on nearly every page. It was also a very dense book, and I was trying to cram the artwork in any place it would fit. On top of that, I was working against a very hard deadline, as I had a European vacation planned and wasn’t going to have access to anything for 2 weeks. I rushed the job and screwed up. I put art in that was the wrong resolution, I reversed a few pieces, I even used some archived art that we no longer had the rights to. I have no one to blame but myself. I cut corners and I messed it up. Thankfully, HERO’s senior AD Fred Hicks was available to fix my mistakes and the book got released on time. And luckily for me, the guys at HERO were gracious and forgiving, and they’re still giving me work. BK: You and I had a discussion about this after this year’s ENnie Awards ceremony. I suggested that perhaps the biggest players in the industry should graciously disqualify themselves from future nominations, allowing the smaller companies a better chance to take home an award. You countered that each book is written by an individual, and those individuals deserve recognition for their good work, even if they are working for the biggest publishers. That’s a very good argument, and it’s made me re-think my position. BK: I have two different answers to this one, depending on the convention. At a smaller convention, like Genghis Con in Denver, my favorite thing to do is to run games. I love writing scenarios, creating interesting pre-gen characters, prepping my materials. I love the excitement just before the game starts. I like seeing what direction the players are going to take the game. I sometimes run “encore” games that I ran at previous cons, and it’s always a delight to see how a different group of players is going to deal with the same situations, and how they’re going to do things differently than previous groups. And I love talking about the game afterwards with my players, to see what was good, what could’ve been better, and what memories we created together. At big conventions, like Denver Comic Con or Gencon, my favorite part is actually the people-watching. I’m not usually what you’d call an extrovert, but I love meeting people at these conventions, talking with them, learning which aspects of nerd-dom are their favorites. Are they gamers? Comic book fans? Film geeks? I’ve gotten to talking with people at conventions, and within 10 minutes it’s like we’ve known each other for years. I feel like I’m among my people. RW: Tell us about the bunny! Roughly how many pictures has he starred in to date? One of the Bunny’s many admirers. BK: The Bunny! I got the bunny years ago when I was on a business trip. There was a table in the airport to let people sign up for a credit card. I did, and they told me I could take any of the free gifts from their table. Most of the gifts were crap, so I grabbed a little stuffed white rabbit. So I’m walking around the Denver airport with this bunny in my hand, wondering what I should do with him. If you’ve ever been through the Denver airport, you know that there are a lot of really weird art displays. So I started putting him up next to the art displays and taking his picture. Now, whenever I travel I take the bunny (whose name is Jack, or J.J. for short) and take his picture everywhere I go. He’s been as far away as Ireland (I even have a pic of him kissing the Blarney Stone). When I go to conventions, J.J. gets his picture taken with cosplayers and celebrities. I have no idea how many pictures J.J. is in. I got about 400 shots of him at Gencon 2013, and that was with me working most of the time and not taking very many pictures. So it’s easily in the thousands. Folks can check out the bunny’s photos on his Facebook page: Travels With Teh Bunneh. RW: What is your favorite genre of gaming – superheroic, fantasy, cyberpunk, etc.? And why? BK: My first love has always been high fantasy gaming. I got my start in AD&D, and while I love to dabble in other genres I’ll always go back to a good fantasy game. BK: I’d be the despicable and vicious leader of a punk-rock biker gang, prowling the wastelands. We’d be like post-apocalyptic Vikings, pillaging, looting, and burning everything still standing, until a heroic loner with a penchant for violence and a soft spot for women, kids, and animals finally puts a permanent end to our depredations. BK: Tough question! There’s so many that I love. I’ve never really been a “One System To Rule Them All” kind of guy, so I’ve played all sorts of games and systems. You and I have argued about this one, but I have to give mad props to D&D4. I’ve been kind of getting into Savage Worlds lately, and I’m looking forward to doing more with it. Take it around the block a few times, see what it can do. I’m playing in a Rogue Trader campaign right now, which is all kinds of crazy fun. d6 Star Wars. Hollow Earth Expeditions. And of course, HERO will always be my true love. BK: Whatever you want to run, man. If you’re the game master, I’m in! Okay, I think I’ve finally got this comment thingy working…. Excellent interview, gentlemen! And it’s amazing how much Mr. Keyes’ early RPG experiences resemble my own. Or did role-players of a certain age pretty much all start out that way? I tend to think we must have all started that way, because I don’t think I’m that unique.